Like most other clinical operatories, the Dentist’s are becoming more versatile by offering multiple services to their patients. However, different procedures can mean purchasing and creating the space for all the additional equipment. The eStylus was developed not only to provide the Dentist equipment to expand services, but also reduce the amount of space required to perform the additional services. The main target for the device was to combine the speed and control range for both the standard dental procedures (cavity preparation, polishing, etc.) and rotary endodontic procedures. Increase the range of speed (RPM) and control required by additional procedures with the same unit. Provide a way to integrate the electronic system with the more familiar pneumatic foot control for easier market acceptance, with pneumatic systems being the predominate units in the US. And, make the complete system as small as possible and flexible to accommodate different work spaces. Using electronics rather then pneumatics offer smooth, consistent cutting power from 150 RPM to 200,000 RPM. Traditional pneumatic devices do not perform well at low RPM’s used for rotary endodontic procedures. The electronics also provide current feed back to sense torque during the endodontic procedures. True endodontic systems employ torque limiting and on-off speed control, which reduce the chance of file separation. The eStylus endo mode converts the variable foot pedal into an on-off switch. This unique endo mode also offers 4 levels of torque limit sensitivity. 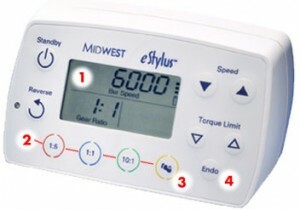 If the file exceeds the torque limit, eStylus flashes the fiber-optics on the contra-angle and automatically reverses the file. By adding and pneumatic coupler to the controller, the users can choose between the new electronic control system or integrate it into the pneumatic dental unit. The same foot pedal that controls air handpieces activates and controls the eStylus motor. Foot pressure controls bur speed, just as is does with the air-powered handpieces, performing all procedures, including endo, with existing pedals. Employing RF technology provides the freedom for the user to separate the RCDU from the controller, allowing the controller to be moved away from the work area, minumizing the space needed during procedures. To assist in generating a small overall package, surface mount technology was employed integrating the RF chip, low level analog signals, high speed digital data, power supply, and the pneumatic sense all on the same multilayer PCB.